This is a series on Teal and Levels of Work. Here is the backstory for the series in case you are interested in the context. The purpose for the series is to explore the tenets of Teal through the lens of Levels of Work. Here was the tease – Hierarchy still exists, but not where you may have historically found it. Even Laloux (Frederic Laloux) provides a hint, but then moves on, assuming to have dismissed the idea of hierarchy altogether. Yet, if you can postpone your dismissal, you will come to find insights that open doors that seemed shut. Let me step back and approach, replacing the word hierarchy with organizational structure. You can structure the organization anyway you want, hierarchy is one way, there are others. Organizational structure is the way we define the working relationships between people. In Levels of Work, based on Requisite Organization, we see two kinds of working relationships, managerial and cross-functional, drawn on a piece of paper, it appears as a hierarchy. This article by Richard Bartlett brilliantly sets the context – Hierarchy is just a shape. Bartlett often uses concentric circles to visually represent working relationships. It is a more pleasant affront to the senses to see amorous circles instead of a dominating pyramid. However, if you center yourself over the concentric circles as the tip of a cone, the friendly circles become an edge-less draconian pyramid. So, is it really that draconian? How does Elliott’s research provide a lens to look through? Requisite Organization and Levels of Work is not a power based hierarchy, but one that acknowledges the complexity of problem solving and decision making faced by every organization in the pursuit of its mission and vision. Put any group of people together, give them a problem to solve and they will self-organize into some sort of structure. They will define and normalize working relationships among them, some unspoken and informal, some formal and articulated. Some structures work well, some are dysfunctional. As Laloux brilliantly points out in his progression of colors, the social bonds that hold those structures together change, from fear, to violence, conformity, achievement, pluralism and evolution. Hierarchy is a taxonomy to map a system into nested relationships of recognition, influence, skill and competence. Laloux had it right. Elliott’s research describes functional organizations where hierarchy is based on the complexity of problem solving and decision making. It replaces power with accountability. Accountability requires authority (without authority, to make a decision or solve a problem, there can be no accountability). This is a natural hierarchy, that if you look closely, is described by Laloux in his progression of colors Magenta-Red-Amber-Orange-Green-Teal. I have to break this up, or my head will hurt, but Laloux’s detailed description of hierarchy is in my path. With an understanding of Elliott’s Levels of Work, it becomes crystal. 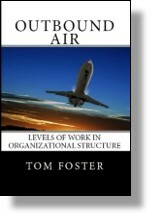 This entry was posted in Accountability, Organization Structure and tagged manager, organizational structure, role of manager, self directed work groups, teal on April 17, 2019 by Tom Foster. You described one role of a manager is to bring value to the decision making and problem solving of the team, collectively and individually. Let’s say I buy that. How does a manager do that? How does a manager bring that value? The role of the manager is to bring value to the problem solving and decision making of the team. Easy to say, more difficult to do. How does a manager bring that value? I spend hundreds of hours each year coaching CEOs. You are not privileged to those 1-1 conversations, but can you imagine that I tell each of my clients how to run their business? The answer is no, they wouldn’t listen to me anyway. So, how do I, or how does any manager bring value to that 1-1 conversation? When the level of work creeps up and there is uncertainty in decision making and problem solving, how does the manager bring value? The most effective managers are not those who tell people what to do, but those who ask the most effective questions. This entry was posted in Accountability, Levels of Work, Time Span and tagged levels of work, manager, timespan on January 18, 2019 by Tom Foster. You talk about time-leverage. You talk about working one hour to gain two hours productivity. How does that work? No manager can afford to work at a time ratio of 1:1. Working one hour to gain one hour’s productivity is a shell game for amateurs. Even working managers need a significant focus on time-leveraged activity. How does a manager work for one hour and gain two hour’s productivity, or work one hour and gain five hours productivity? Call a 20-minute meeting with three of your team members. In the meeting, you describe your vision for project completion. Describe the performance standards for project completion (including quality and time frame). The rest of the twenty minute meeting is a discussion of the action steps and who will be responsible for what. Schedule two follow-up meetings (ten minutes each). As the manager, you end up with less than one-hour of meetings, while your team members work five hours to complete the project. You work one hour, you get five hours of productivity. Ratio (1:5). Here’s is the challenge, what does (1:10) look like? I consistently work with executives whose goal is (1:100), one hour’s work to produce one-hundred hours of productivity. How about you, what is your ratio? This entry was posted in Accountability, Delegation Skills and tagged delegation, manager, working manager on February 26, 2018 by Tom Foster. The only person who can hold you accountable is YOU. Invite and give permission to others to examine and challenge your commitments, AND understand that you are the only one who can keep those commitments. The only accountability is self-accountability. We cannot hold people accountable, we can only hold people to account. This is not a nuance of language. Holding others accountable is a myth. We cannot hold others accountable. We can only examine and challenge commitments. We can only hold people to account, to themselves for the commitments they make with themselves. This entry was posted in Accountability and tagged accountability, coaching, manager on January 19, 2018 by Tom Foster.